....The project represents an academic work approached since the conceptual phase. The objective involved the coherent and solid design of a high complex project, which difficulty is implicit in its function and scope: a pediatric clinic with attention for 100 beds. ....The patios are protagonists at different heights, looking for a relationship between construction and nature. The paths are fluid and rational, providing zones of permanence with visuals to green areas, which promote states of serenity and harmony. ....Through a composition of pure volumes where white and a minimal use of colors predominates, the work of artist Piet Mondrian is reinterpreted, whose work is selected to reflect simplicity and strength at the same time. Access points are accentuated with primary colors (first colors that kids learn to recognize) to capture the attention of the children audience and to turn the building into a work of art in an integral way. The purpose is to generate interaction between users and green areas, offering a warm atmosphere and contact with therapy gardens, recreation and waiting zones, as well as spatial connections throughout the whole building. In more detail, the fundaments of anthropometry and the innate curiosity of children is considered, so the clinic's interior stands out in color and scale management, reflecting a design of friendly and fun spaces for infants. .. El propósito es generar interaccion entre los usuarios y las áreas verdes, ofreciendo un ambiente cálido en las áreas de descanso, jardines de terapia, recreación y espera, así como conexiones espaciales en todo el conjunto. A nivel de detalle se parte de la antropometría y curiosidad innata del niño, por lo que su interior destaca por el manejo del color y la escala, reflejando un diseño de espacios amigables y divertidos para los infantes. One of the major challenges was the resolution of the functional part of the project. Therefore, it was based on a deep research process on hospitalary normative and dynamics. 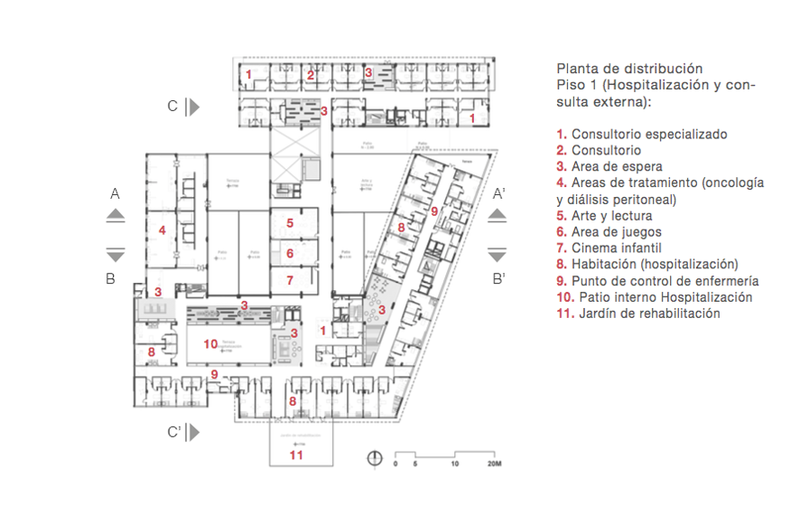 At the ground floor, three access points are proposed, an Emergency Department access (1), and two other that allow the entrance to Hospitalization (2) and the Consultation Centre (3). .. Uno de los mayores retos fue la resolución de la parte funcional del proyecto: una clínica pediátrica con atención para 100 camas. Por lo tanto, se apoyó en un proceso de investigación profunda sobre la normativa y dinámica hospitalaria. A nivel de implantación se plantean 3 accesos, un acceso de emergencias (1), y otros accesos que permiten el ingreso a hospitalización (2) y consulta externa (3). The general scheme is focused in grouping at one storey (Emergencies ground floor) the largest number of attention and immediate clinical support units for maximum operability, especially in Critical Care Areas, where there is a direct connection between Surgery, Intensive Care Unit and Emergencies. .. Se aborda un esquema en el que se relaciona en un nivel (planta baja Emergencias) la mayor cantidad de áreas de atención y de apoyo clínico inmediato para una máxima operatividad, especialmente de área crítica, donde existe conexión directa entre quirófanos, unidad de cuidados intensivos y emergencias. 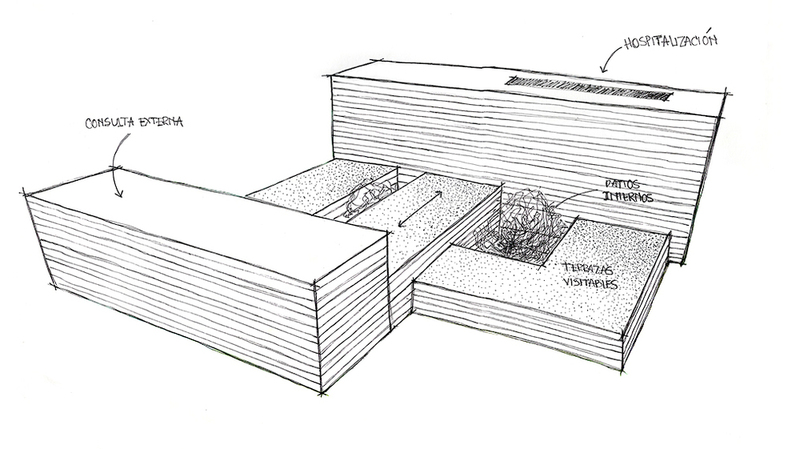 ....Project sections: spatial connection between volumes and patios, offering a repertoire of contact areas with nature.